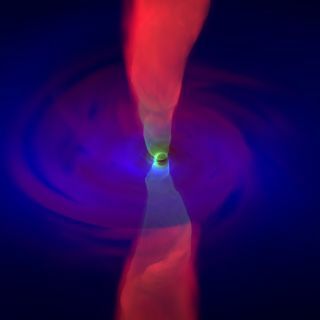 An image from a simulation showing how matter might be moved around in the extreme environment around a black hole. The simulations will be compared to observational data collected by the Event Horizon Telescope, which will be increasing its sensitivity in 2017 and 2018. KISSIMMEE, Fla. — Get ready for your close-up, black holes: The Event Horizon Telescope (EHT), which will take some of the best images of black holes ever captured by humans, is ramping up its worldwide network of telescopes. By 2018, the EHT will be an observatory that harnesses the power of nine telescopes around the world, including ones in Chile, Arizona, Hawaii, Antarctica and Greenland. These instruments will work together to get higher-resolution images than any of these scopes can achieve alone. The target of their observations will be black holes — scientists hope to see the material moving around these dark monsters, as well as the shadow of the black hole itself. Other telescopes have studied black holes in the past, but the goal of the EHT is to take images that surpass the resolution of any previous black-hole snapshots. With that information, scientists would be able to see the area around a black hole — a place where the pull of gravity is so extreme that very strange things happen. Images made from simulations showing how matter might move around in the extreme environment around a black hole. Scientists hope to use the simulations to better understand observations taken by the Event Horizon Telescope. For example, the black hole at the center of the galaxy known as Messier 87 has a massive, narrow jet of material, roughly 5,000 light-years long, spewing away from it. In contrast, the black hole at the center of the Milky Way — Sagittarius A* — has very little matter around it and no jets. In galaxies known as active galactic nuclei (AGNs), black holes accelerate huge clouds of material around them, and radiate more light than the entire Milky Way galaxy. What leads to such a drastic difference between these objects? With EHT, Ӧzel said, scientists may finally be able to answer that question. "Is it the magnetic field structure that is different? Is it the spin that is different? Or is it something else about the accretion flow that is different?" Ӧzel said. "This will open a brand-new window into studying accretion physics." And then there's Einstein. His theory of general relativity has been tested using observations in Earth's solar system — for example, the way light bends around the sun — and beyond. But there are few cosmic environments as extreme as the one around a black hole, where the gravity can be millions of times stronger than it is around a star. As a result, the EHT will reveal the effects of gravity (which are described by the theory of relativity) "on scales that have never been probed before," said Ӧzel, who is a scientist on the EHT project team and is leading some of the theoretical work that will be combined with the observations. "Get to the edge of a black hole, and the general relativity tests you can perform are qualitatively and quantitatively different," Ӧzel said. Understandably, Ӧzel and other black-hole scientists are eager to start getting data from EHT. One of the major requirements of imaging black holes in such high resolution is to have a very large telescope. In fact, Ӧzel said that achieving the resolution of EHT effectively requires a telescope the size of the Earth. "Of course nobody would fund an Earth-sized telescope," Ӧzel said. But the "next-best thing" is to combine observations from multiple telescopes on the surface of the Earth that are separated by very large distances, Ӧzel said. With this technique, scientists can observe an object in significantly higher resolution than the telescopes could achieve alone — effectively giving scientists an "Earth-size" telescope. The first data from the EHT project were collected in the mid-2000s, by three telescopes — one each in Hawaii, Arizona and California. The group collaborated to look at the black hole at the center of the Milky Way galaxy, called Sagittarius A*. In 2014, the collaboration added the Atacama Large Millimeter/submillimeter Array (ALMA) in Chile to its array, and doubled its resolution, according to the EHT website. Six telescopes in the EHT array are already taking data, and a total of nine are expected to be contributing to the project by 2018, according to Shep Doeleman, principal investigator for EHT. Early in 2015, the collaboration added the South Pole Telescope to its array, which connected the other telescopes such that the EHT effectively spanned the entire Earth. In 2017, the EHT will be able to make observations with ALMA that will boost its sensitivity by a factor of 10, Doeleman told Space.com in an email. In 2018, an additional telescope will join the group from Greenland. "One of the innovative aspects of the EHT is that we use existing telescopes at the highest altitudes (where they are above most of the atmosphere) and outfit them with specialized instrumentation that enables us to link them together," Doeleman said. "So we don't build new dishes, and we leverage over a [billion dollars] of existing telescopes." However, there are still obstacles, he noted. "Last year, one of the facilities participating in the EHT had to close due to lack of funding," Doeleman said. "We can still do all the EHT [work] planned because new sites are coming online, but we remain 'en guard' for threats against EHT sites."